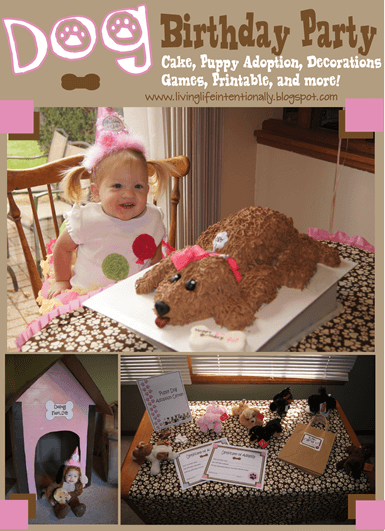 Lots of fun ideas for a Dog Birthday Party for your child’s next birthday. 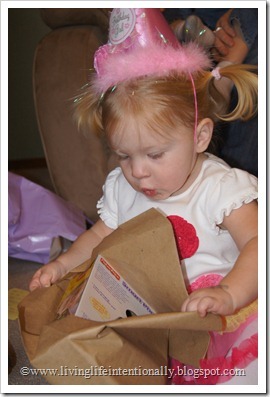 No matter what theme you choose, here are 20 Ways to Make Birthdays Extra Special. Tinker bell LOVES dogs! She has since I can remember. So it seemed like a very natural choice for her 2nd birthday party theme! It was a huge hit! 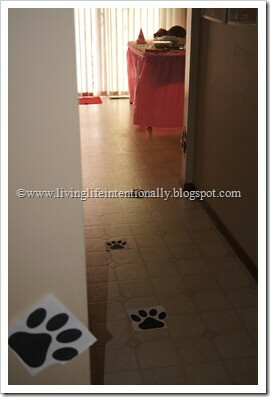 I tapped paw prints along the floor and wall leading to the party room (these are in the free download too!). 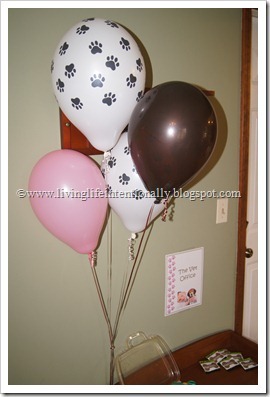 I got super cute paw print balloons and added some of the party colors too. 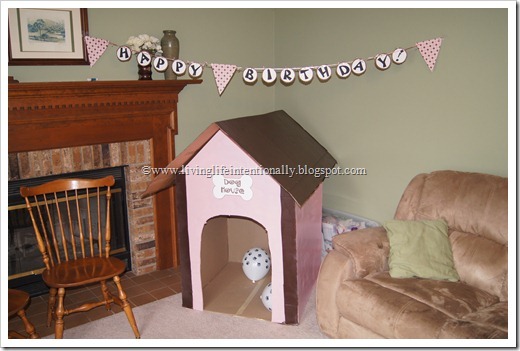 We also made a dog house out of a box cardboard box. We spray painted it her party colors: brown and pink. The kids had so much fun playing in it!! 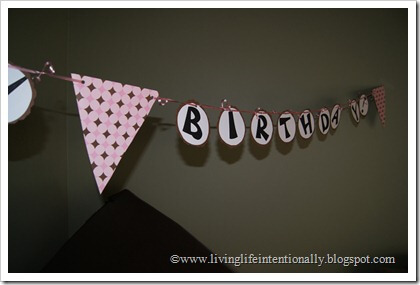 I made a Happy Birthday banner in her party colors. For the pendants, I used scrapbook paper and then I printed letters on brown cardstock and cut around them with scrapbook scissors. The whole thing was held together by pink curling ribbon to attach each letter to the one before and after it. As this was a family party for a 2 year old we kept it simple. 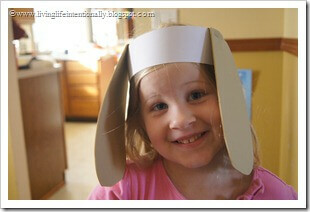 I had the kid make their own dog ears. 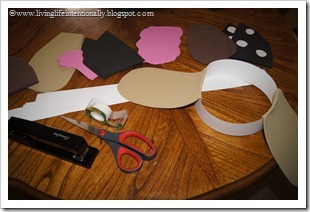 The headband is white cardstock and the ears were free cut from foam sheets. The kids seemed to really enjoy being able to pick their own dog ears and looked so cute too!The main activity was a Puppy adoption center. This was a HUGE hit! 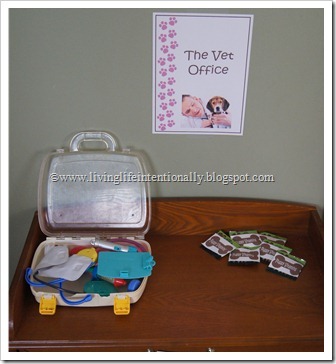 It was the perfect activity for the kids (2-7 year olds) and made a great parting gift too. I had the kids pick a bone out of a hat that had a number on it. This was the random order in which they got to pick their puppy to adopt. I got one extra so even the last kid would have a choice. These super adorable, cuddly puppies were wonderful. I got them from Stuffed Safari. I love that they each had their own personality – they are so lovable! 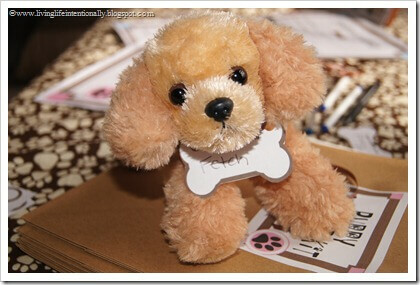 The kids then gave each of their dogs a name and put that on their bone nametag which we attached with curling ribbon. 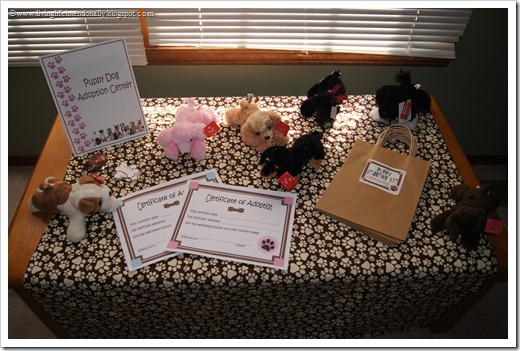 Then we filled out their adoption certificate and gave each kid a Puppy Starter Kit bag to collect their other goodies. The kids could then visit the remaining stations in whatever order they wanted (which helped minimize waiting too!). 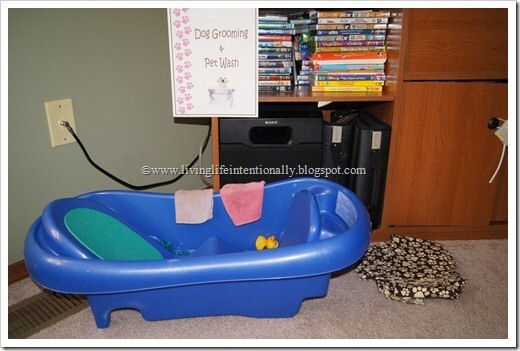 Here is the Dog Grooming & Pet Wash station where they could give their dogs a good wash. After the wash they were given a blanket with dog prints to wrap their puppies in to take home. 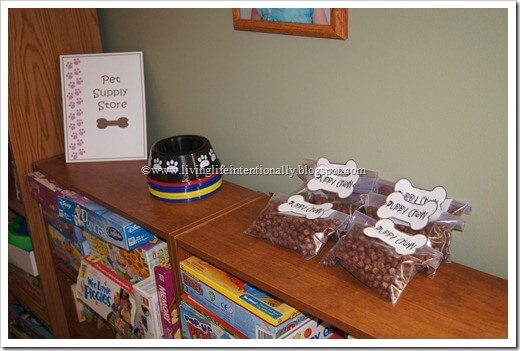 The Pet Supply Store had a dog bowl (from Target dollar section), Puppy Chow (Cocoa Puffs), and yellow tennis ball toy for each kid to add to their bag. Finally, they went to the Vet Office to give their puppy a check-up before taking them home. They got Puppy Vitamins (gummy bears with label) to add to their bag too. 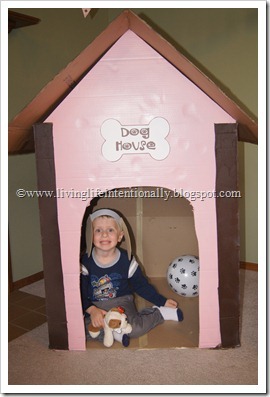 Finally, I took pictures of each kid with their puppy in the dog house. I included these in their thank you note. Since we were hosting out of town family I had the party at 2pm to allow them time to get here. It was a little too early for our birthday girl who was napping, but she did GREAT! It was also a nice time so we wouldn’t need to serve much food. We served pupcorn, puppy chow, dog bones (Scooby Graham snacks), Orange Sunrise Punch, and cake & ice cream. 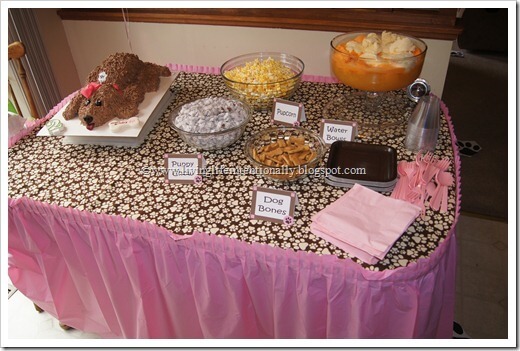 I found the paw print material I used as a tablecloth at JoAnn Fabrics and put a pink table skirt around it to polish it off. Here’s the birthday girl with her dog cake. 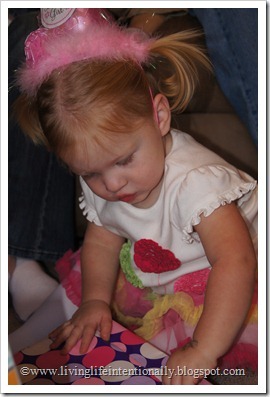 I got her outfit at Gymboree, the hat at Party City, and here is a step-by-step tutorial on how I made the cake. In case you don’t want to reinvent the wheel…. I decided to include the printables I made for the party. You can download the boy and girl puppy adoption certificates, food labels, dog house label, dog station signs, pet collars, kids name tags, and puppy prints. Just remember these are for your personal use only. Please do not sell, share, or host anywhere else.You are welcome to link others back to this page, but not to the download only link. Thanks! I’d love it if you took a moment to leave me a comment! I read every one and they always make my day =-) Thanks!